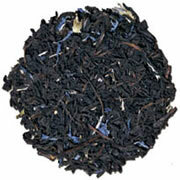 Summary : This earl grey tea from Culinary Teas is, quite simply, a superb earl grey tea. The tea has no bitterness and quite a bit of "kick" to it as well. If you like earl grey tea, well, by all means...give this one a try. Review : I love earl grey teas. Exactly why I do not know. After all, I'm not a huge fany of "traditional black teas" in many ways...I find the taste of a traditional black tea to be often too strong with a nasty after-taste, along with some bitterness. Yet, I just love earl grey teas. Perhaps because I'm a spice-a-holic, and a good earl grey tea will have...or at least should have...some kick to it! And so it was that I found myself on a Saturday snowy evening in December wishing for some kick in my life. I dug through my tea collection and found a earl grey tea from Culinary Teas. Here is how Culinary Teas describes this tea on their website : "An Earl Grey tea lovers Earl Grey. Strong bergamot with bright citrus characters." Well, my first encounter with this tea was certainly a pleasant one. Once you rip open the bag the tea comes packaged in you'll be greeted with a very powerful aroma indeed that says earl grey all over it. And indeed, this was a true earl grey tasting tea if there ever was one. The tea once brewed has a beautiful coppery color to it. And the taste, well, let's just say it beats the pants off of any bagged earl grey tea you'll ever try. And the tea has a nice little kick to it, as a good earl grey tea always should. How about tea bitterness? There was none, simple answer. Overall, for me at least at the time of this writing, this tea from Culinary Teas defines what a quality earl grey tea should taste like. It has a powerful flavor, a nice little kick, no bitterness and a rather subdued yet pleasant after-taste. Recommendation : Yes. If you like earl grey teas, then you'll love this tea. And if you haven't tried a earl grey tea yet...may I make a suggestion? Make this tea your first earl grey tea tasting experience. Too many supermarket brands of earl grey teas either taste wimply or just plain bad. But this one defines what a quality earl grey tea tastes like...so why waste money on cheap bagged versions?